6773 Bl.1b Export fair souvenir sheet 1949 in of the rare colour \"30 penny greenish slate (dark greenish blue) \" fresh colors and in full original size, in perfect condition mint never hinged a very sought, nearly always missing issue! Photo expertize Schlegel BPP. 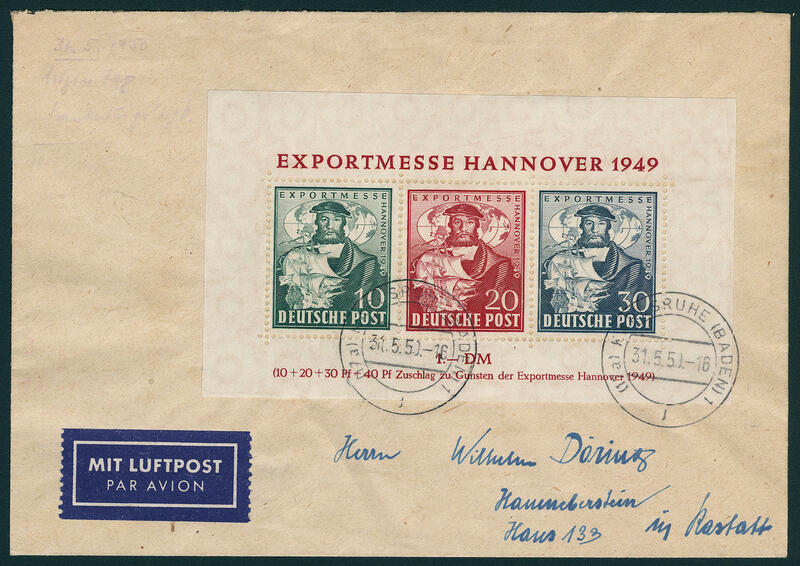 6774 ✉ Bl.1c Export fair souvenir sheet 1949, the scarce color error \"30 PFG. 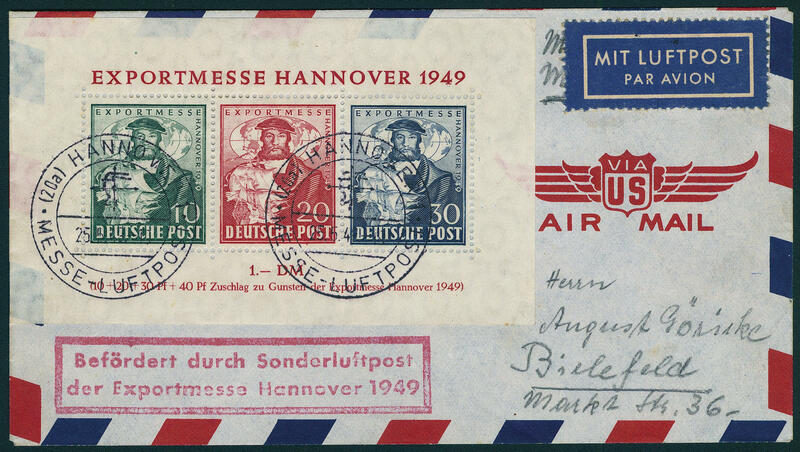 Black violet ultramarine\", fresh colors and in full original size in utterly perfect condition on very nice, not correctly franked air mail letter with appropriate special cancel \"Hanover 25.5.49. 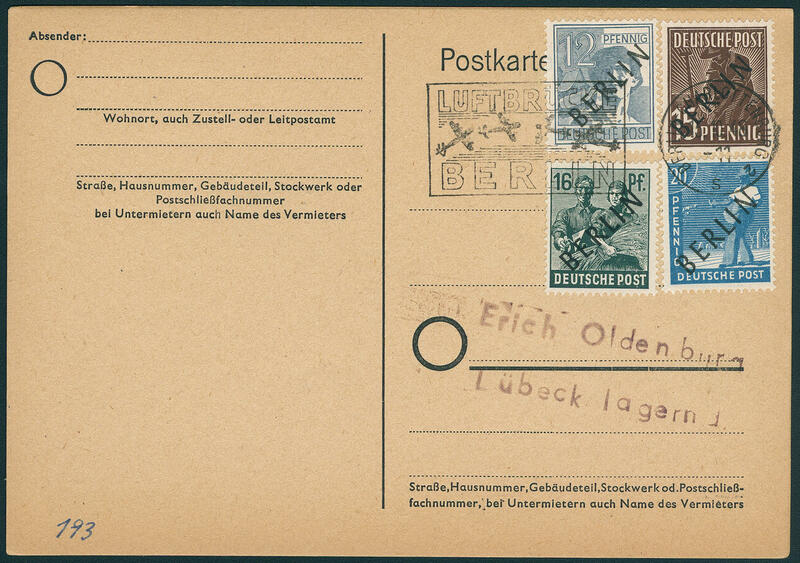 \" to Bielefeld with arrival postmark. An especially nice cover this good colour! Photo expertize Hans-Dieter Schlegel BPP. 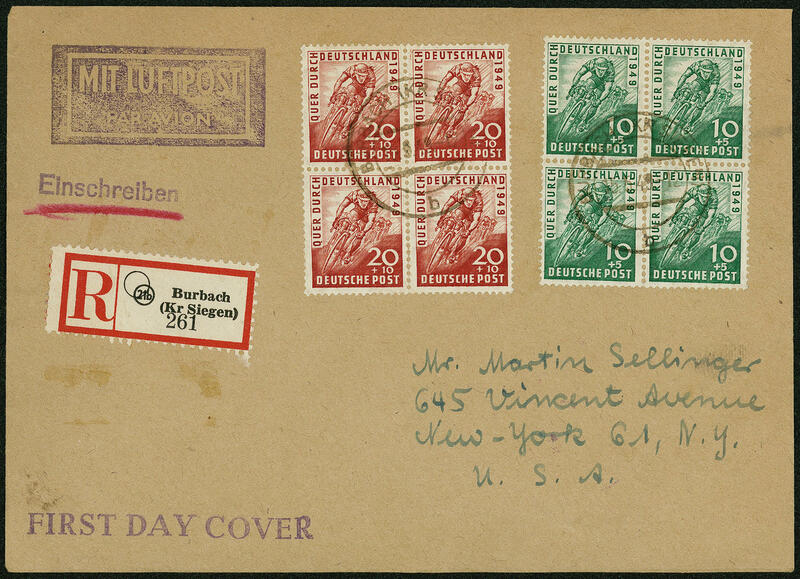 6775 ✉ Bl.1c Export fair souvenir sheet 1949, the scarce color error \"30 PFG. 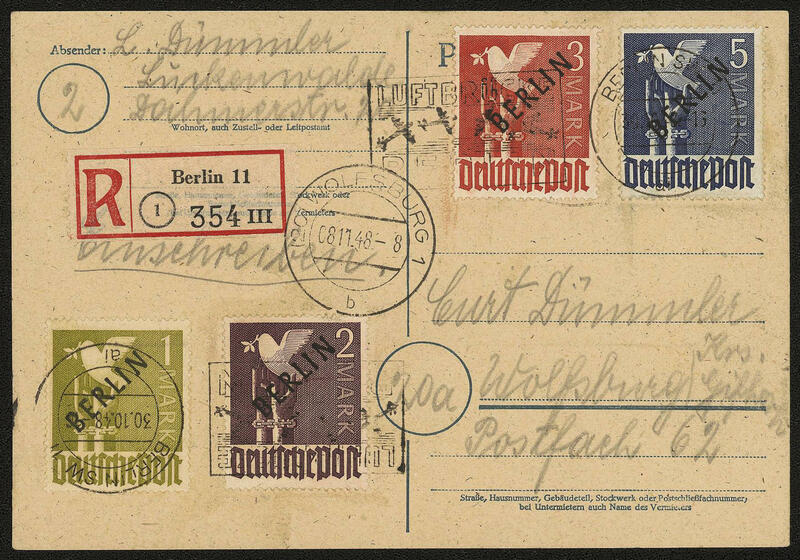 Black violet ultramarine\", fresh colors and in full original size in perfect condition on not correctly franked airmail cover, neat cancelled \"KARLSRUHE 31.5.50. 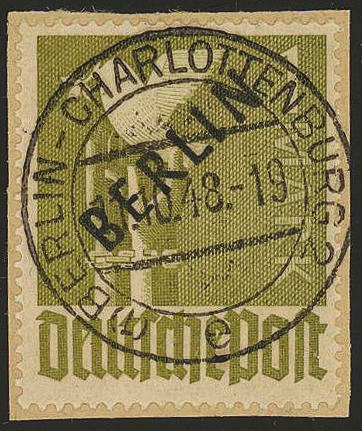 \" to Haueneberstein. 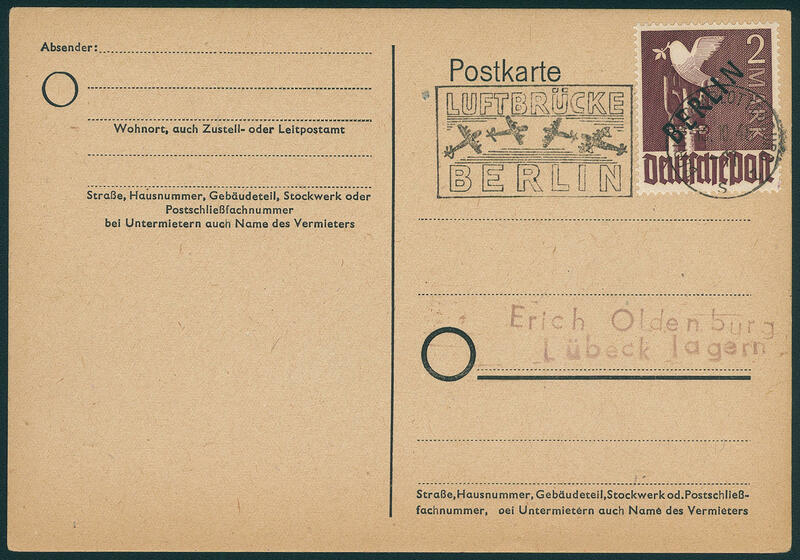 A particularly beautiful last day use this souvenir sheet rarity, the in almost all collections is absent! Expertise Schlegel BPP. 6776 106/07 Cycle race 1949, 50 sets as left half sheets, in perfect condition mint never hinged Michel 1100,- €. 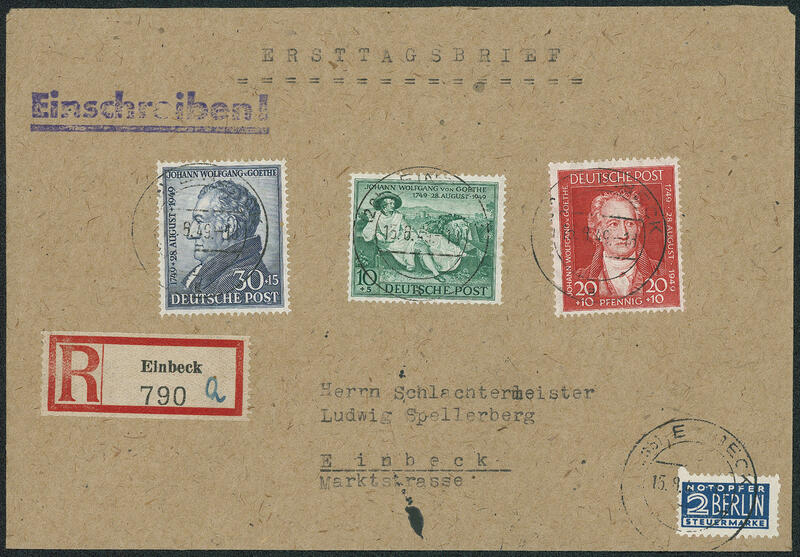 6777 FDC 106/07 Cycle race 1949, faultless block of four set on genuine postally used registered airmail First Day Cover from \"BUBACH 15.9.49. 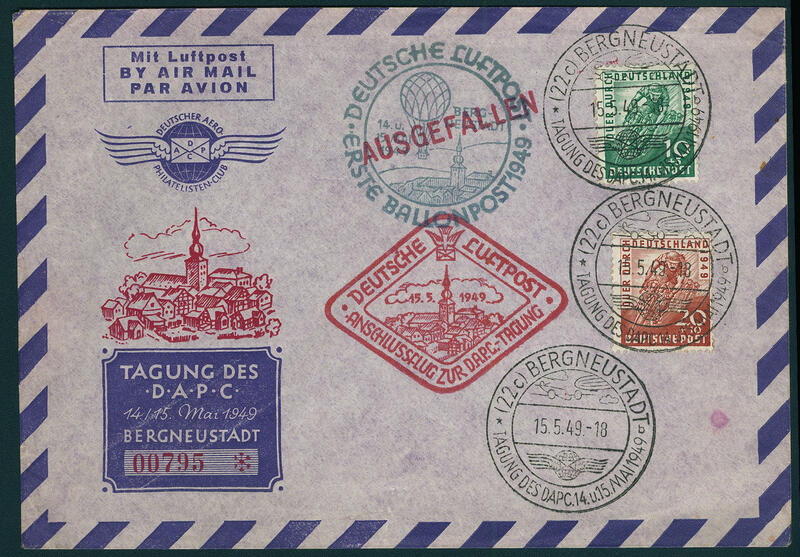 \" to New York with arrival postmarks. 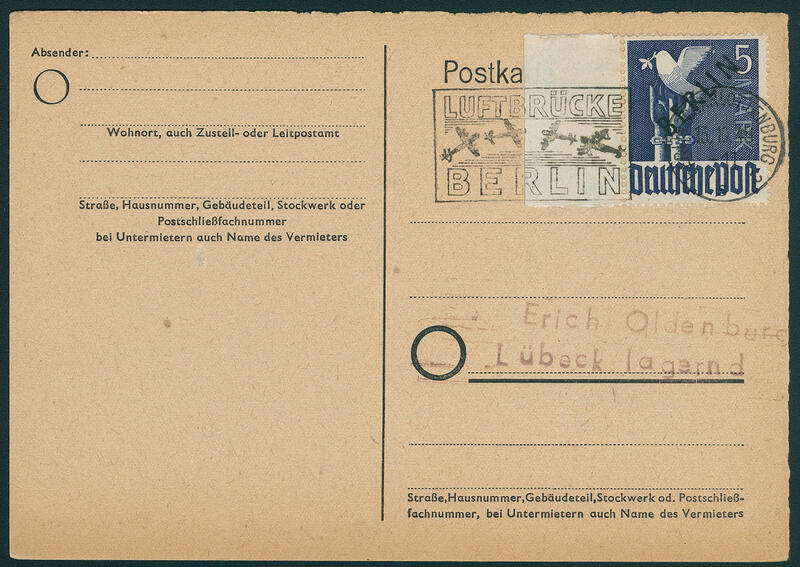 In this kind a rarity the post-war philately! 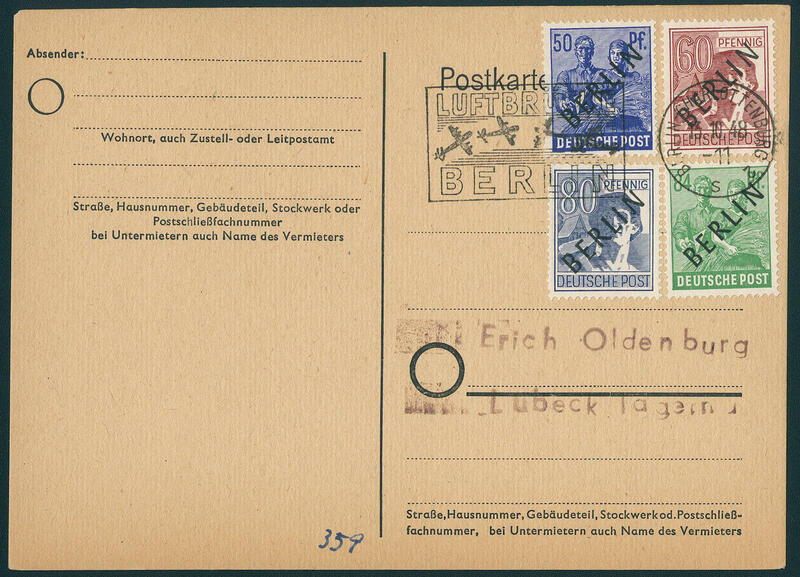 6778 FDC 106/07 Cyclist 1949, both values on faultless First Day Cover with first day special cancel \"Mountain new city 15.5.49. 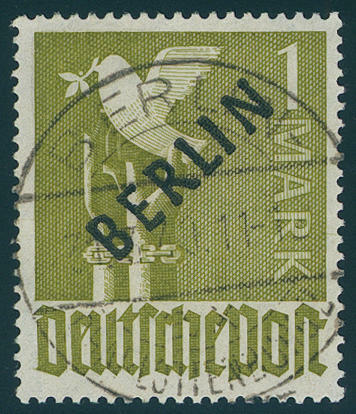 \" and additional airmail special confirmation stamps. 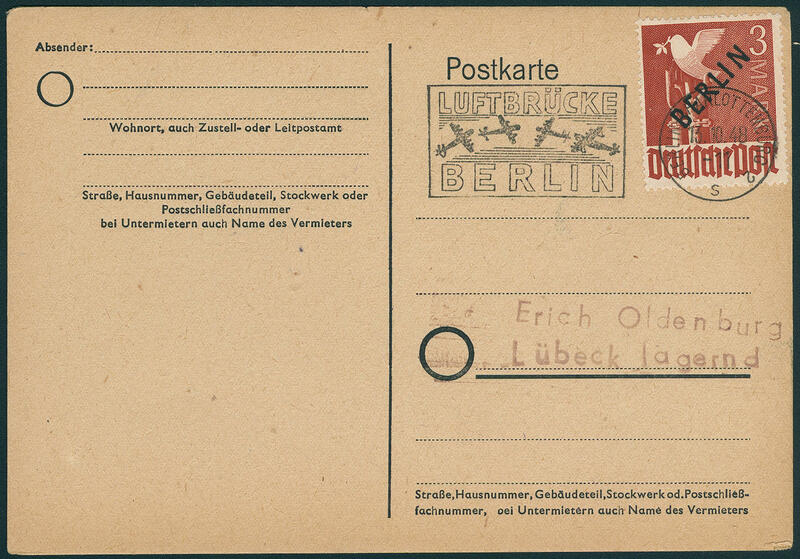 A very decorative and rare First Day Cover! 6779 108 10 Pfg. 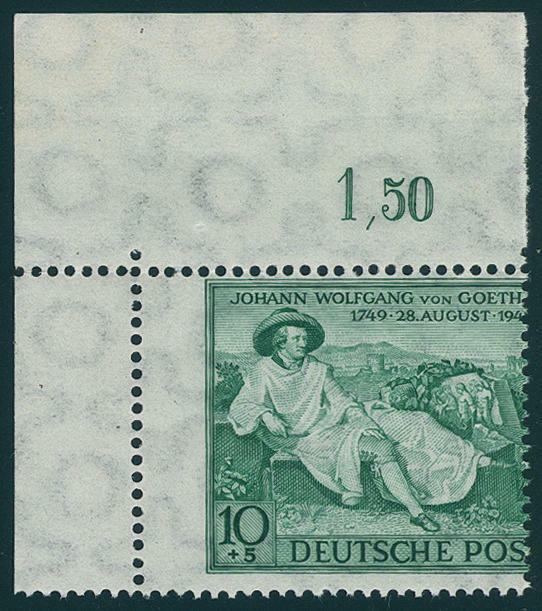 Goethe 1949, left upper corner of the sheet with extremely strong defective or badly placed perforation, in perfect condition mint never hinged a decorative and scarce variety! 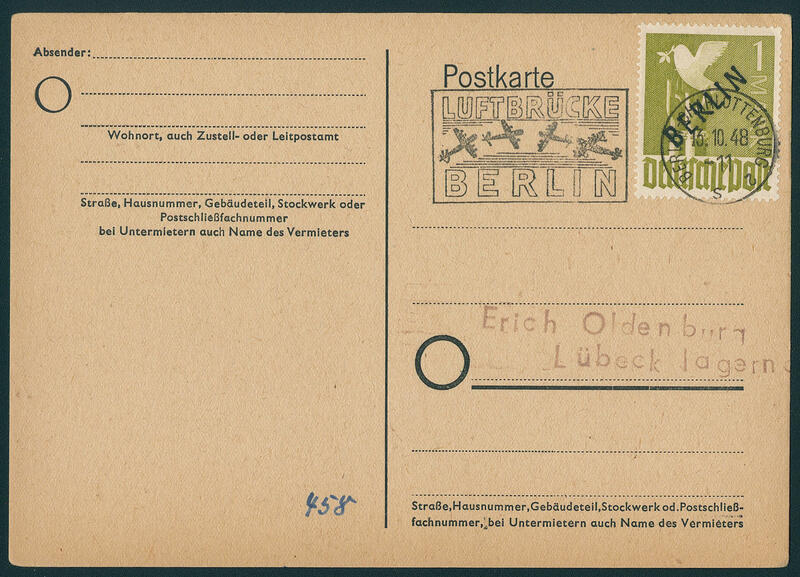 6780 FDC 108/10 Goethe set 1949 on faultless, very nice First Day Cover from \"EINBECK 15.8.49. \". 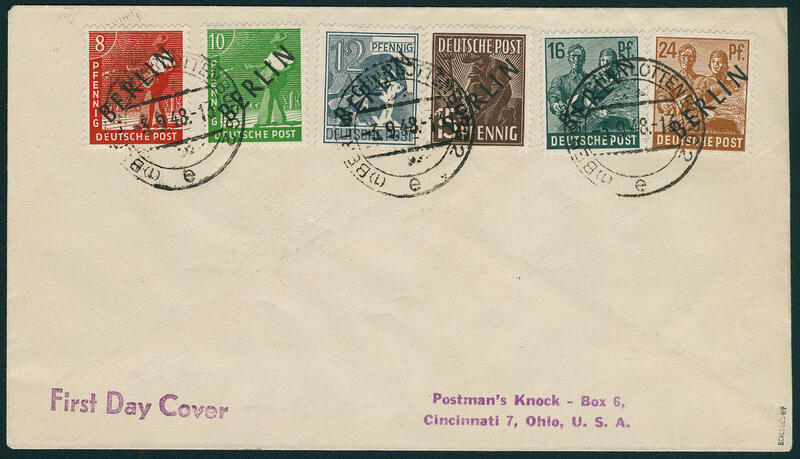 An on First Day Cover very scarce issue! Photo expertize Schlegel BPP. 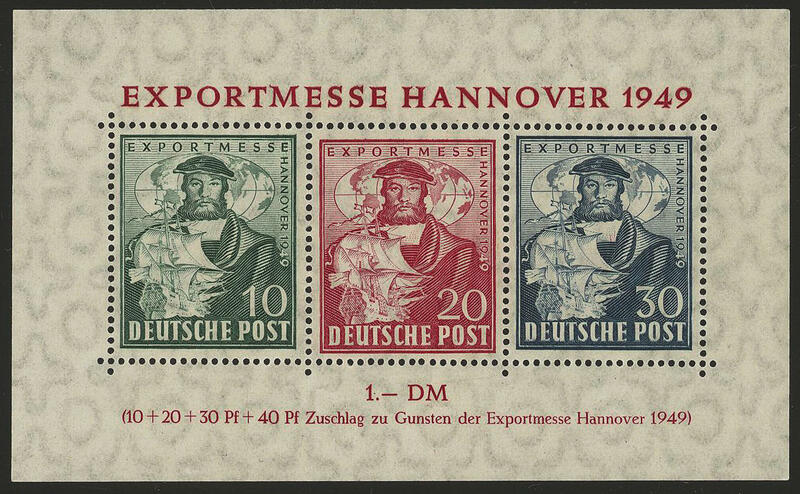 6781 ⊙ Bl.1a Export fair souvenir sheet 1949, in perfect condition with first day special cancel \"Hanover 22.4.49. \", expertized Schlegel BPP. Michel 250,- €. 6417 ∆ Jan 16 2-84 Pfg. 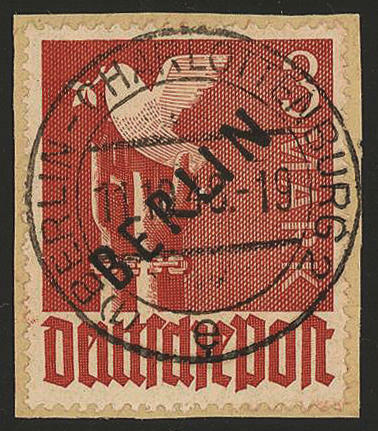 Black overprint, all 16 values fresh colors and very well perforated on very nice letter pieces, perfect and neat cancelled \"BERLIN-CHARLOTTENBURG 18.10.48. \", photo expertize for former set \"the quality is perfect\" Andrew Schlegel BPP. 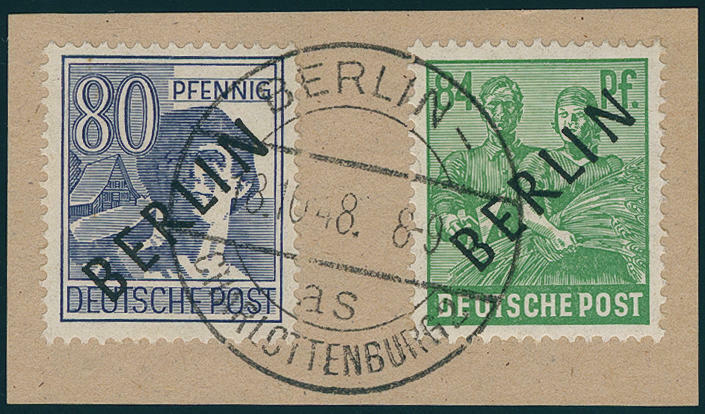 6418 Jan 20 Black overprint 1948, fresh colors and in perfect condition mint never hinged, expertized Schlegel BPP. Michel 360,- €. 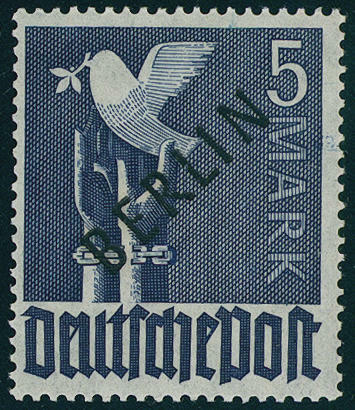 6419 Jan 20 Black overprint 1948, in perfect condition mint never hinged, expertized Schlegel BPP. Michel 360,- €. 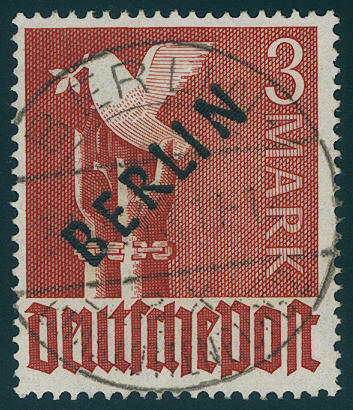 6420 ⊙ Jan 20 Black overprint 1948, all 20 values wonderful fresh colors and very well perforated, uniform especially nice centric cancellation \"BERLIN-CHARLOTTENBURG 31.3.49. \". An exception set for the highest standards! Photo expertize \"the quality is perfect\" Andrew Schlegel BPP. 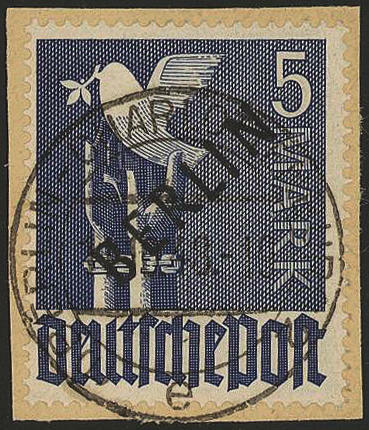 6421 ∆ Jan 20 Black overprint set 1948, all 20 values on wonderful letter pieces, uniform neat cancelled \"BERLIN-CHARLOTTENBURG 11.10.48. \". An outstanding set for the highest standards! Photo expertize \"the quality is perfect\" Hans-Dieter Schlegel BPP. 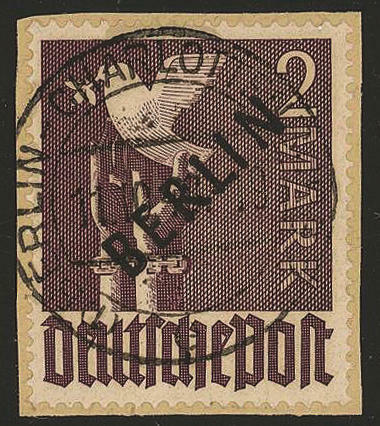 6422 ✉ Jan 20 Black overprint 1948, the complete set from 20 values on eight postcards with airlift cancel \"BERLIN-CHARLOTTENBURG 13.10.48. \". 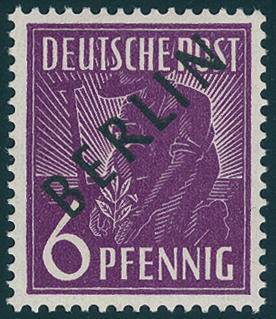 All stamps are fresh colors and in perfect condition. An especially attractive set! Photo expertize \"the quality is perfect\" Hans-Dieter Schlegel BPP. 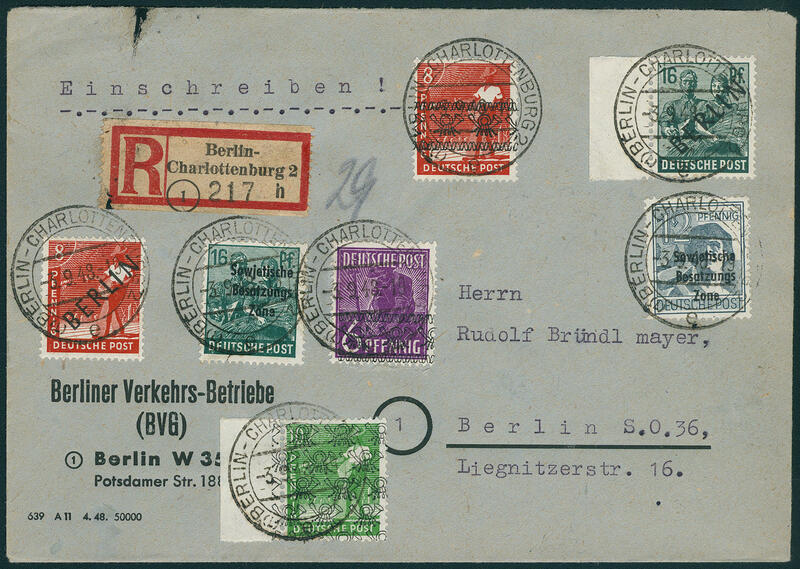 6423 ✉ Jan 20 Black overprint 1948, faultless set on five beautiful long-distance postcards, partly as registered transported, with airlift cancel \"BERLIN 30.10.48. \". Photo expertize \"the quality is perfect\" Hans-Dieter Schlegel BPP. 6424 2x,5x 6 Pfg. And 12 Pfg. 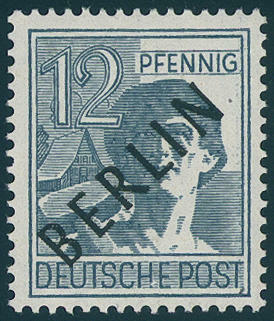 Black overprint on good thick paper, in perfect condition mint never hinged, expertized Schlegel BPP. 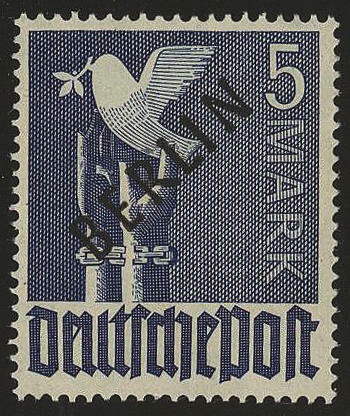 6425 FDC 3,7 8 Pfg. And 16 Pfg. 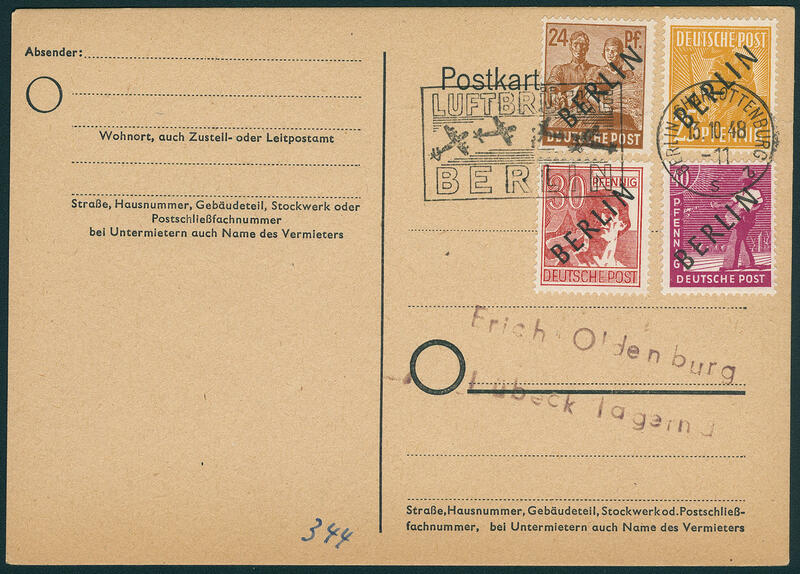 Black overprint on faultless registered First Day Cover from \"BERLIN-CHARLOTTENBURG 3.9.48\" in mixed franking with Soviet Zone / American/British Zone in the local usage used with arrival postmark. 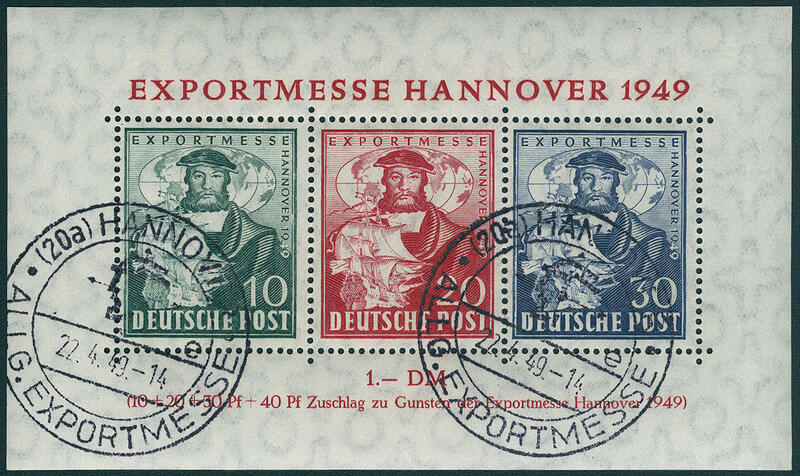 First-Day-Covers the black overprint issue are general rare, in this combination especially decorative and exceptional! 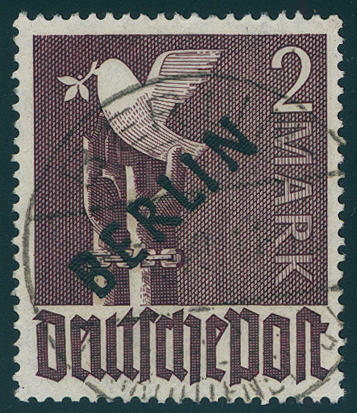 6426 FDC 3/7,9 8, 10, 12, 15, 16 and 24 Pfg. 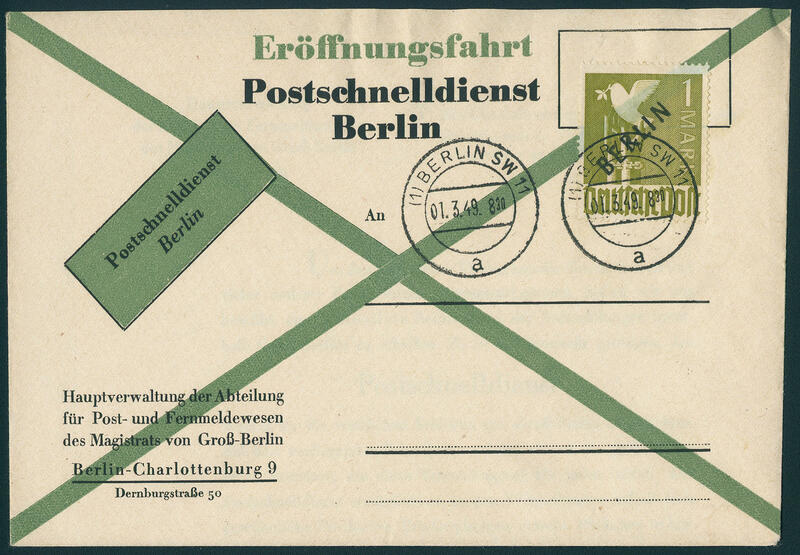 Black overprint, fresh colors and in perfect condition on First Day Cover from \"BERLIN-CHARLOTTENBURG 3.9.48\" to cincinnati / USA with arrival postmark. Very rare! Expertized Schlegel BPP. 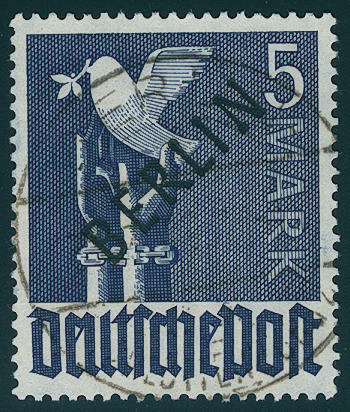 6427 FDC 17 1 Mk. 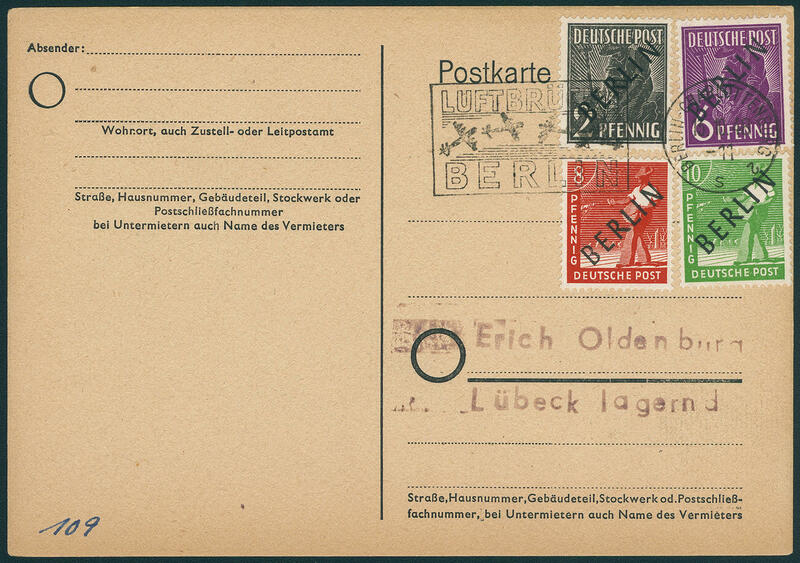 Black overprint on faultless official First Day Cover to the opening of the Postal service fast service with postmark \"BERLIN 1.3.49. \" with the corresponding Enclosure leaf. Michel 750,- €.